One of the greatest films in history is being offered on Blu-ray Disc for half-price at Amazon.com. The Godfather (Coppola Restoration) on Blu-ray Disc from Paramount’s Sapphire Series normally sells for $29.99 MSRP but is now available for $14.49 (52% off). The 3-time Oscar winner (10 total nominations) was digitally restored and formatted in 1.78:1 widescreen aspect ratio at 1080p with TrueHD 5.1 Surround Sound or Dolby Digital 2.0. This is a single-disc release coded in MPEG-4 AVC on a BD50. The 1972 film was written by Mario Puzo and directed by Francis Ford Coppola. The Godfather stars Marlon Brando as Don Vito Corleone, Al Pacino as Michael Corleone, and James Caan as Santino ‘Sonny’ Corleone. The all-star cast also includes supporting roles from Robert Duvall, Diane Keaton, John Cazale and Talia Shire. 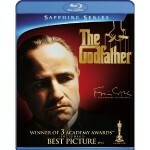 The Sapphire Series disc was originally only available as part of 4-disc complete collection of all three Godfather films titled “The Godfather Collection: The Coppola Restoration.” Check out the specially priced Blu-ray Disc of the first of the Godfather trilogy on Amazon.com.